Need help with your fall planting tasks? Make planting easier this season with our fall perennial planting tips! We have ideas and tips to help you, including soil depth and watering tips. Fall planting is a garden maintenance task that can help your plants thrive for years to come with the proper know-how. Other fall garden tasks include pruning, mulching, weed control, and possibly pest prevention. Listen to our quick segment on this "DIY Garden Minute" to learn about tips you can use for garden success. This episode is for those of you newbies to more advanced gardeners who need help with the basics of planting your fall perennials. Also, check out our Best Pruning Shears post here! Be sure to listen to our Podcast Episode 22, the start of our 7-episode mini-series on the 8-Fall Garden Tasks you should be doing and learn how to join our Fall Bootcamp Challenge! 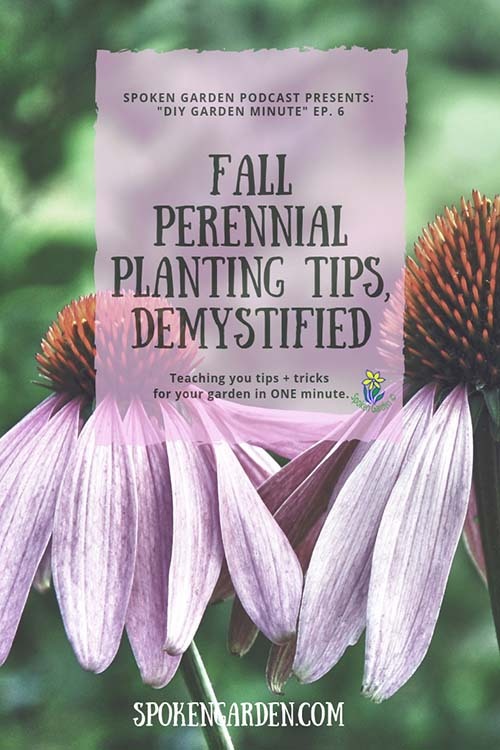 Save "Fall Perennial Planting Tips" directly to your Pinterest page for later! Need help with your fall planting? Learn planting tips and tricks about planting your perennial plants in the fall to help them thrive later. Why perennials should be planted in the fall. Tips and strategies for easier planting in the fall. Digging depths for your plants.